After two and a half years of middle-of-the-night song-writing and guitar-playing sessions, Benjamin Brekke’s debut album “Be Not Afraid” is almost ready for release. Like many aspiring artists and entrepreneurs, Brekke has turned to Kickstarter to raise money to complete his project. Kickstarter, a crowd-funding website, allows entrepreneurs and artists to create public pledge campaigns to support their work. The campaigns offer rewards, like free digital downloads or free concerts, for every pledge. Brekke, a member of St. Mark in St. Paul, hopes to raise $2,000 on Kickstarter by Sept. 4 to finish mixing, mastering, packaging and distributing his CDs. He is about halfway to his goal. Inspired by eucharistic adoration, the lives of the saints, and the blessings and struggles of life, Brekke’s music and lyrics offer hope and inspiration. “Be Not Afraid,” with honest lyrics and an eclectic mix of instruments including guitar, ukulele, piano, drums, tuba and trumpet, explores themes of mercy, belonging and hope. One song, “Belong to You,” addresses Brekke’s struggle with clinical depression and the sense of belonging that leaves him during low times. 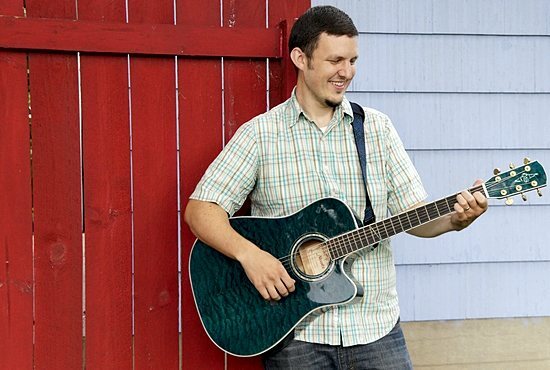 “Mercy,” a song featured on Brekke’s Kickstarter page, describes the struggle and then peace found in “give it to God” moments when life becomes so overwhelming that your only choice is to let go. Brekke also believes the strength and importance of the Catholic message encourages everyone to support local Catholic musicians. Besides Brekke, several Catholic musicians with local roots found support using crowd-funding websites. To learn more about Benjamin Brekke and “Be Not Afraid,” visit his Kickstarter page, or email benjaminleebrekke@gmail.com. « What did Jesus look like, and does it matter?